Celebration time for County Armagh's Junior players at the SuperCupNI. Pic by PressEye Ltd.
County Armagh’s Junior players had the consolation of a draw to tackle Manchester United after missing out on the SuperCupNI semi-finals by a single goal. Results on Wednesday left the Orchard County boys fifth in the group standings and, as a result, entered into the Globe tournament for the fourth day of play. 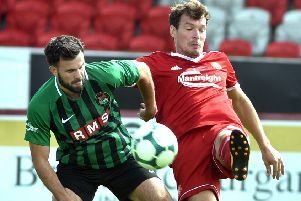 Having kicked off the tournament on Monday with a Glasgow Rangers game, County Armagh were handed the opportunity the tackle another of the competition’s high-profile touring teams with a clash in Coleraine against United. County Armagh entered this summer’s week-long event as holders of the Globe trophy. “It is disappointing to finish one goal short of what was needed to make the SuperCupNI knockout stages but playing a club with the appeal of United on a big pitch like Coleraine Showgrounds offers another memorable opportunity,” said Dean McCullough, the County Armagh SuperCupNI Association chairman. “The boys are getting used to playing in front of big crowds and to end the group stages unbeaten with two wins and a draw is a positive start. County Armagh’s Premier squad is set to face County Tyrone on Thursday at Clough in Ballymena from 3.30 across the SuperCupNI Bowl.